I thought I was done with building retro PC's but I happened upon an AT tower recently that got me thinking about a machine that was pretty significant to me back in the day (in hindsight). 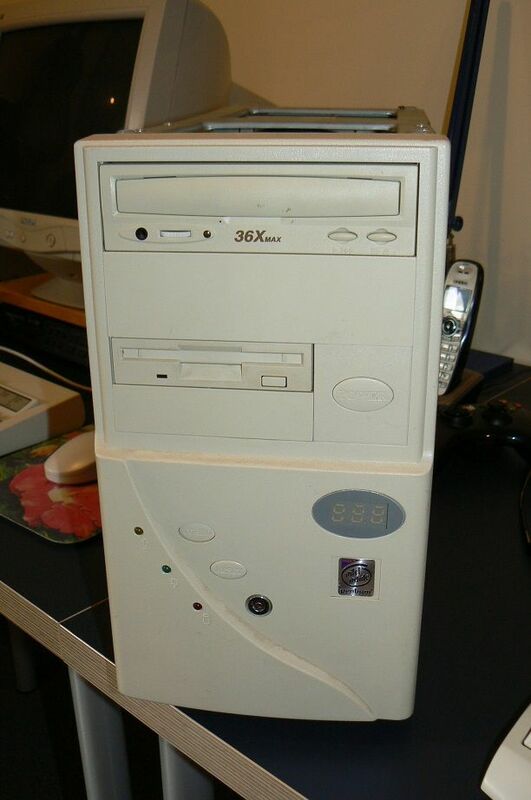 It was the last of the PC's I built from the spare parts resulting from my father's CAD machine upgrades; I was living under his house at the time in a converted garage, circa 1999. Technically an adult but only on paper - I was battling through a computer science degree at university, working as a kitchen hand, and being generally awkward and unsure about everything. Against all odds I got my CS degree, landed a job in the city, and ultimately moved out of my garage home. There was nowhere to set up a PC in the tiny apartment I’d rented and I was busy killing braincells and racking up credit card debt anyway, so I dumped the 6x86 in a cupboard and forgot about it. A year later I moved into a share-house with more space, and DOOM in particular reminded me how much I loved escaping into a virtual world. My trusty old AT machine was a relic by that point though; when I moved in with my future wife a year later and I compared its specs to her PC and mine came up short, I unceremoniously dumped it on the nature strip and started planning an Athlon 64 machine. Sentimentality and nostalgia weren't something I did until recently, but I did at least have the foresight to copy off my dubious artworks, HTML, guitar tab, etc. The original only had a 2 digit display, set to HI and LO. I must have gotten a bee in my bonnet about airflow at some point because I distinctly recall drilling holes in the bottom of the front bezel - these 6x86s do get pretty hot. This "new" case is in pretty good condition but was very dirty - the PSU was too awful to contemplate so went directly into the bin, and there was sand everywhere for whatever reason; even inside the CD drive. The plastic wasn't yellowed and the paintwork was generally good, after some minor touching up. For a CPU and motherboard I just went with what I had in my spares pile - a Cyrix 6x86MX PR233 and a GA-586T2. The PR233 of course doesn't run at 233MHz, it's a 188MHz part that the Cyrix marketing department rated as being equivalent to a 233Mhz Pentium. I must admit that I'd forgotten about that trickery and was initially confused and anxious when Speedsys reported a frequency of 187.5MHz, but the penny dropped soon enough. The motherboard was easy to work with for the most part - I updated the BIOS for no particular reason and was pleased to find that I had the PS2 mouse backplate stashed away. There's a USB header too but I haven't bothered with that - the IDE -> compact flash adapter makes transferring files just as easy. In saying that though the CF adapter caused me several hours of frustration because it turns out that having it as a slave on the primary IDE port caused the system to wig out occasionally. I was able to install Windows 98 initially but then files were becoming corrupted and partitions were going missing randomly. I suspected everything but the CF adapter because I've used those several times in other machines, but after moving it to being the master on the secondary IDE port it's all good and has been 100% stable since. As a result of the CF adapter cluster fudgery, I went through several HDD, RAM, and VGA card combinations before the dust settled. 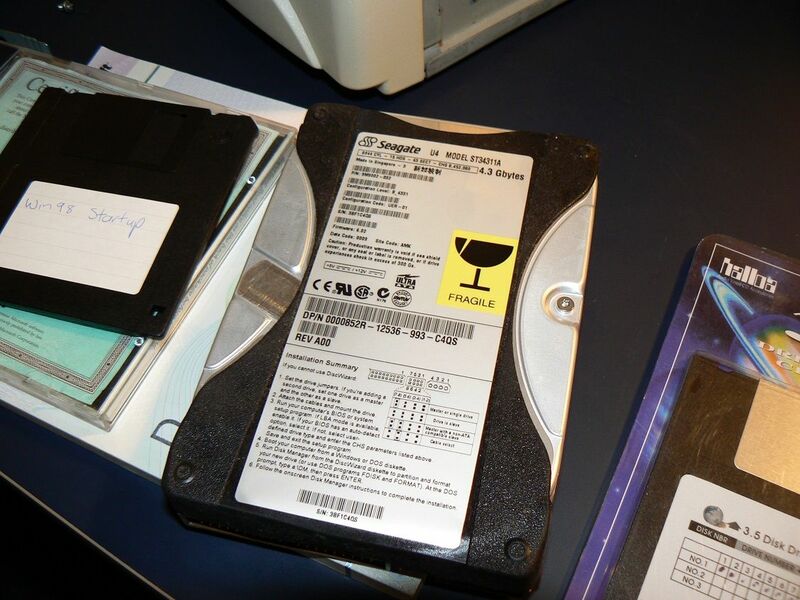 I ended up with a 4.3 GB Seagate ST34311A HDD, 64GB SDRAM (max that the MB can cache), and a 2MB Matrox Millennium (faithful to the original). 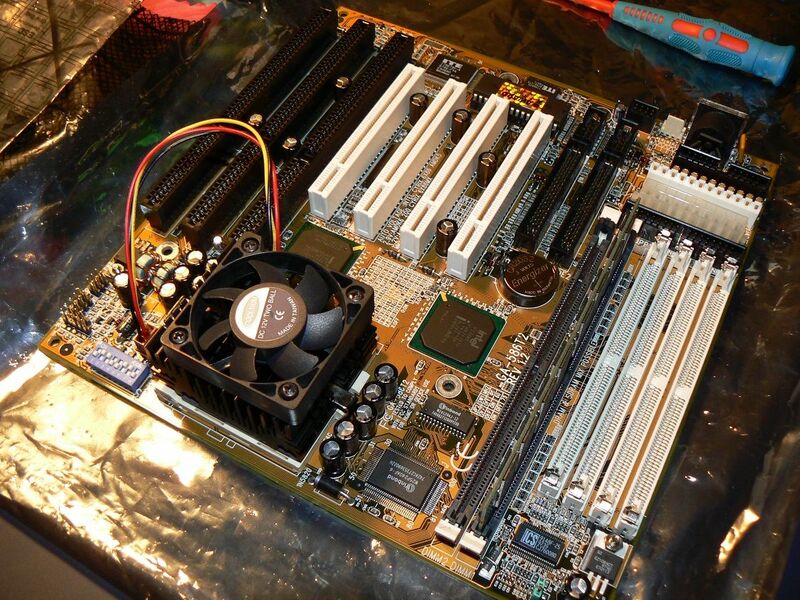 Just for fun I ran Phil's benchmark suite and Chris' SVGA bench on several PCI VGA cards in this system as I put it together - Tseng ET6000, ARK Logic 1000PV, Diamond Stealth 64, #9 GXE 64, ATi Rage 2C. Some could equal the Millennium for speed and some are more compatible with old DOS games, but the image quality and nostalgia factor got the Matrox the gig. Choosing a sound card is always the hardest part of any build for me and I got my knickers well and truly in a twist this time. I won't bore you with the details but I auditioned at least 10 cards (including some multi-card setups). After days of painful indecision I was left choosing b/w a nice Aopen AW32 Pro (Crystal S23A with CS4235 & onboard wavetable) and my favourite implementation of the ES1688 chipset (a Labway card). The Audiodrive gives some ground in sound quality but not by much, and I love ESFM. The CS4235 on the other hand has the worst sounding FM I've heard, so I would have had to pair it with a PAS16 and it all got too hard. For GM I snuck a Crystal CS9233 based wavetable card on - it's only 1MB but sounds great I think. So far I'm loving this PC - it's 1999 all over again. Most of the games I've thrown at it run well but a couple - Network Q Rally for example - do chugg slightly with full details on (that's a SVGA game). 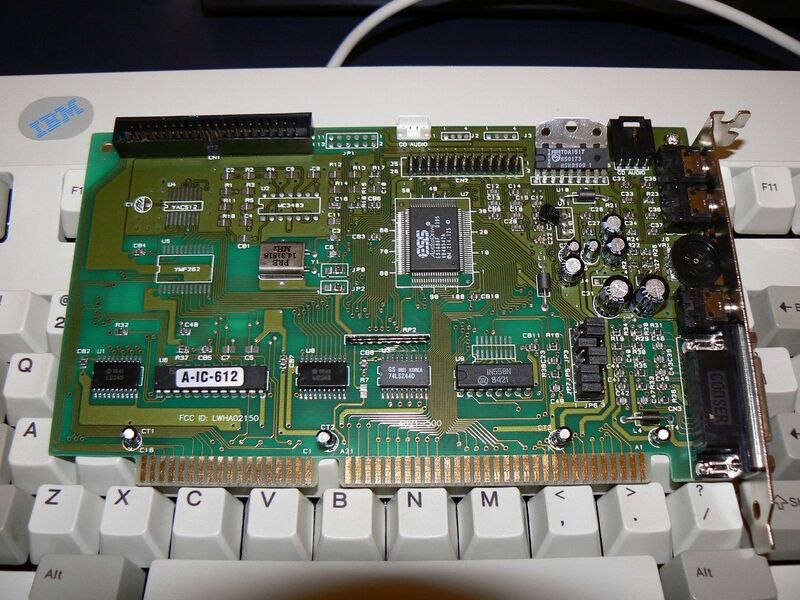 It's workable but just for fun I've ordered a Cyrix MII-300GP (which really does run at 233MHz); I'll be interested to see how that handles SVGA. 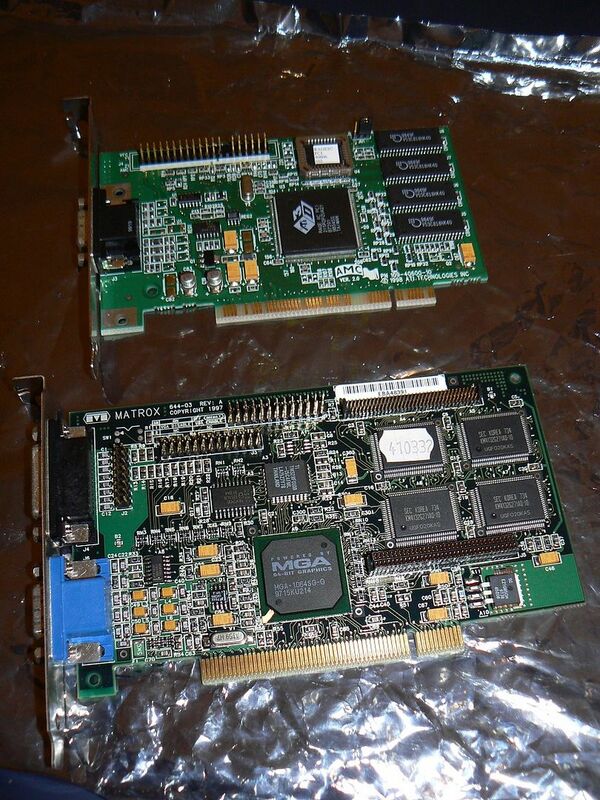 That is not a Matrox Millennium 2MB but a Mystique 4MB I believe. Very cool PC though! Looks like a Mystique... guessing from the thinner connectors. Beautiful machine - the CRT is nice... I dig the rounded tube. back in the day when I upgraded to a ss7 system from 486/66 I also got the pr233 6x86 cpu , it was really fast in windows and apps. appiah4 wrote: That is not a Matrox Millennium 2MB but a Mystique 4MB I believe. Very cool PC though! And yes Quake was really this chips Achilles' heel - it runs better than I remember actually but yeah, not great. amadeus777999 wrote: the CRT is nice... I dig the rounded tube. Yeah I love that monitor - bought it NOS a while back. I have a couple of flat screens here too that have better geometry but the round tube feels right. The only way you're going to party with a Cyrix 6x86 is if it's 1996. 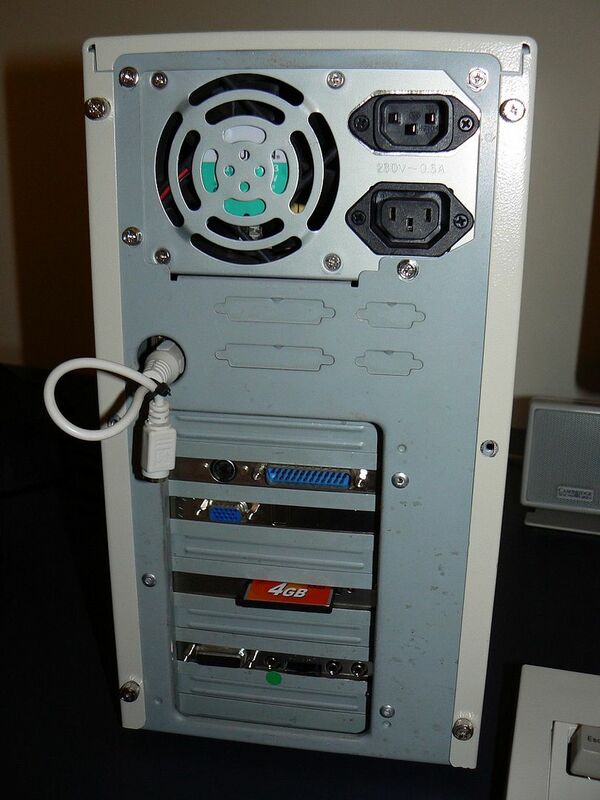 Anonymous Coward wrote: The only way you're going to party with a Cyrix 6x86 is if it's 1996. 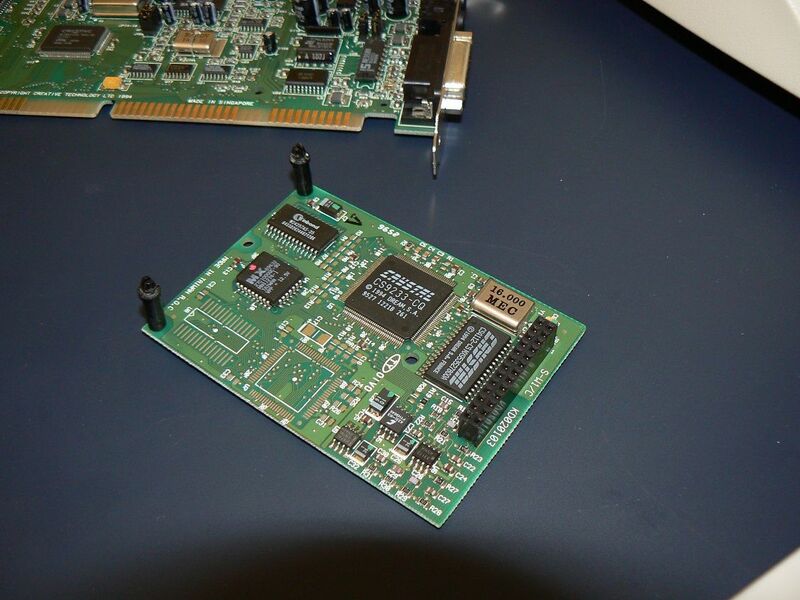 Not only that but by 1999 there were already Socket 7 machines with AGP. 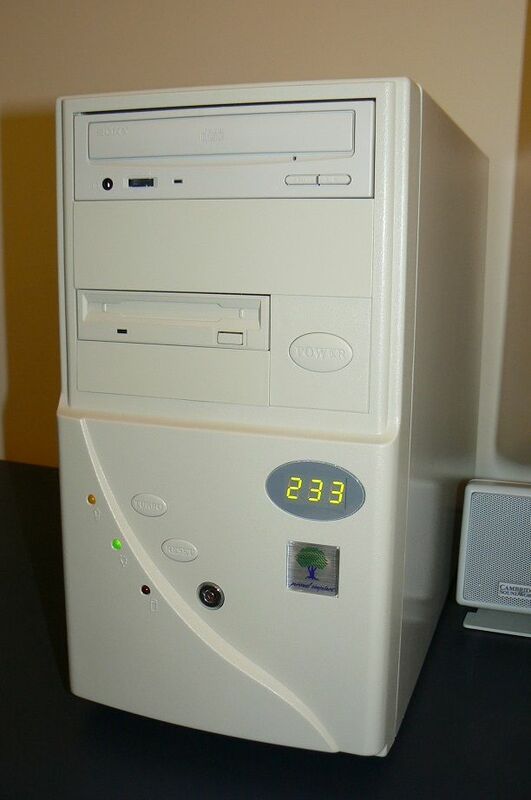 I like this system, it's different (low end for 1998) and would love to own such an AT case. It's 1999ish if you were using it in 1999 (maybe it was all you could afford). Gered wrote: It's 1999ish if you were using it in 1999 (maybe it was all you could afford). Yep it’s what I was using, but I can see where I went wrong. Thank goodness you guys were here to correct me. As someone who had a Cyrix P120+ in 1999, I definitely feel this one! The most fitting hardware for 1999 is what you remember 1999 by, so don't let anyone tell you it's not contemporary; have fun with your system! I think it has much charm. I don't know about the rest of the world, but here in Australia computers were damn expensive, and people would run them for 5 years or more before upgrading. 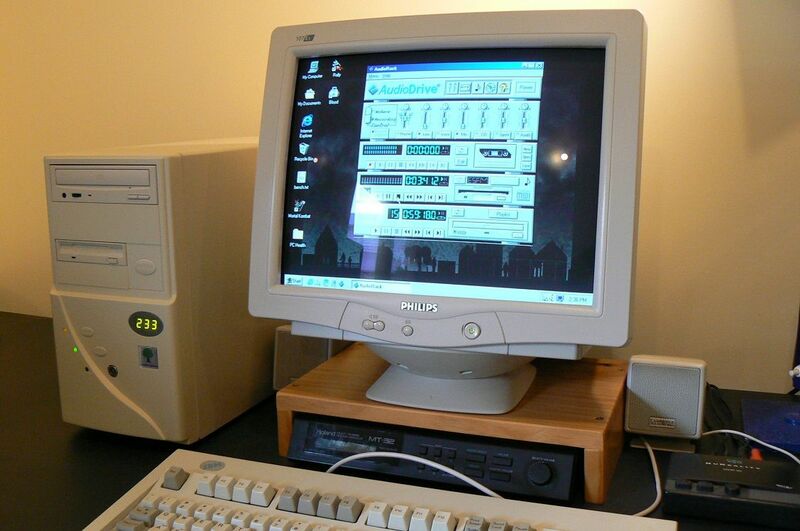 Seeing a Pentium class machine in regular use in 99/2000 was not unusual at all. I second that. Gaming like back in the days is not about having the newest and/or high-end hardware from back in the days, that you couldn't afford or buy. 1999 i was using a K6 with 200Mhz, Trio64V+ and AWE64 Value.